Research background: The first business support organizations (BSO) appeared in Poland in the 90s of the last century. They were transferred from Western Europe and the United States, where they provided system solutions and played an important role in stimulating innovation activity. However, the latter regions are economically developed, while Poland is playing catch-up. The important question is whether business support organizations will significantly increase the innovative potential of Polish enterprises. 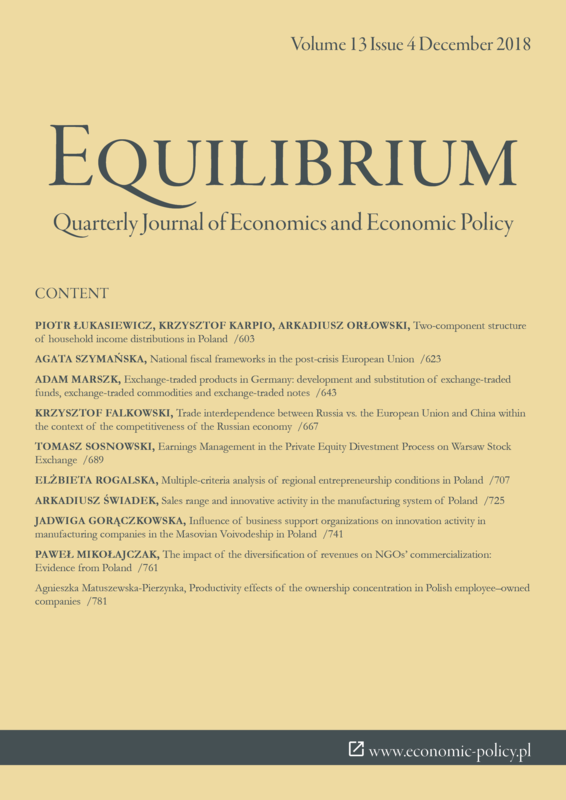 Purpose of the article: The purpose of this paper is to probe the impact of business support organizations on innovation activity in Polish industrial companies. It remains to be determined whether enterprises which use BSO services are more likely to engage in innovation activities than enterprises which do not use such services. Methods: To carry out the study, a multi-factor logit regression method was used. In this study, the method allows the determination of the odds ratio for the likely occurrence of innovation activity in companies that used the services of BSOs compared to enterprises that did not do so. The attributes of innovation activity have been singled out in accordance with the international standards of the Oslo methodology. The study was conducted in 2015 for the years 2012–2014 based on a sample of 951 manufacturing companies in the Masovian Voivodeship. Findings & Value added: In the Masovian Voivodeship it is the technological parks and training and consulting centres which have the most advanced degree of influence on the innovation activity of enterprises. The roles of technology incubators, and loan and guarantee funds are also significant. With regard to cooperation on innovation, there is a much better arrangement in sectoral systems, i.e., with suppliers, customers and competitors, than with scientific institutions. Arauzo-Carod, J. M., Segarra-Blasco, A., & Teruel, M. (2018). The role of science and technology parks as firm growth boosters: an empirical analysis in Catalonia. Regional Studies, 52(5). doi: 10.1080/00343404.2018.1447098. Balcerzak, A. P. (2015). Europe 2020 Strategy and structural diversity between old and new member states. Application of zero unitarization method for dynamic analysis in the years 2004-2013. Economics and Sociology, 8(2). doi: 10.14254/2071-789X.2015/8-2/14. Castillo, F., Gilless, J. K., Heiman, A., & Zilberman, D. (2018). Time of adoption and intensity of technology transfer: an institutional analysis of offices of technology transfer in the United States. Journal of Technology Transfer, 43(1). doi: 10.1007/s10961-016-9468-5. Cesaroni, F., & Piccaluga A. (2016). The activities of university knowledge transfer offices: towards the third mission in Italy. Journal of Technology Transfer 41(4). doi: 10.1007/s10961-015-9401-3. Colombo, M. G., & Delmastro, M. (2002). How effective are technology incubators? Evidence from Italy. Research Policy, 31(7). doi: 10.1016/S0048-7333 (01)00178-0. Danieluk, B. (2010). Application of logistic regression in experimental research. Psychologia społeczna, 5(2-3(14)). Diez-Vial, I., & Montoro-Sanchez, A. (2016). How knowledge links with universities may foster innovation: the case of a science park. Technovation, 50-51(SI). doi: 10.1016/j.technovation.2015.09.001. Etzkowitz, H., & Leydesdorff, L. (2000). The dynamics of innovation: from national systems and ‘‘Mode 2’’ to a triple helix of university–industry–government relations. Research Policy, 29(2). doi: 10.1016/S0048-7333(99) 00055-4. Hülsbeck, M., Erik, E., Lehmann, E .E., & Starnecker, A. (2013). Performance of technology transfer offices in Germany. Journal of Technology Transfer, 38(3). doi: 10.1007/s10961-011-9243-6. Koprowska-Skalska E. (2010). Training and consulting centers. In K.B. Matusiak (Eds.). Ośrodki innowacji i przedsiębiorczości w Polsce. Raport 2010. Warszawa: PARP. Kuczewska, L. (2015). Business services in raising abilities to compete by enterprises using them (research findings). Handel wewnętrzny, 358(5). Liberati, D., Marinucci, M., & Tanzi, G. M. (2016). Science and technology parks in Italy: main features and analysis of their effects on the firms hosted. Journal of Technology Transfer, 41(4). doi: 10.1007/s10961-015-9397-8. Maddala, G. S. (2006). Econometrics. Warszawa: Wydawnictwo Naukowe PWN. Morawczyński, R. (2014). Investment criteria used by business angels. Zeszyty Naukowe Uniwersytetu Szczecińskiego nr 803, „Finanse, Rynki Finansowe, Ubezpieczenia”, 66. OECD/Eurostat (2005). Oslo manual: guidelines for collecting and interpreting innovation data, 3rd edition. Paris: OECD Publishing. doi: 10.1787 /9789264013100-en. Piekunko-Mantiuk, I. (2014). Business angels and their role in the financing of start-up’s. Economics and Management, 4. doi: 10.12846/j.em.2014.04.26. Rocio Vasquez-Urriago, A., Barge-Gil, A., & Modrego Rico, A. (2016). Science and technology parks and cooperation for innovation: empirical evidence from Spain. Research Policy, 45(1). doi: 10.1016/j.respol.2015.07.006. Soetanto, D. P., & Jack, S. L. (2013). Business incubators and the networks of technology-based firms. Journal of Technology Transfer, 38(4). doi: 10.1007/ s10961-011-9237-4. Stanisz, A. (2007). Easy statistics course, Volume 2. Linear and nonlinear models. Kraków: Statsoft. Stokan, E., Thompson, L., & Mahu, R. J. (2015). Testing the differential effect of business incubators on firm growth. Economic Development Quarterly, 29(4). doi: 10.1177/0891242415597065. Świadek, A. (2011). Regional innovations systems in Poland. Warszawa: Difin. Warsaw Statistical Office (2015). Statistical yearbook. Mazowieckie Voivodeship 2015. Warszawa: Warsaw Statstical Office. Vienna Initiative Working Group (2014). Credit guarantee schemes for SME lending in Central, Eastern and South-Eastern Europe. A report by the Vienna Initiative Working Group on credit guarantee schemes. Retrieved from http://vienna-initiative.com/wp-content/uploads/2014/11/2014_credit_guarant ee_schemes_report_en.pdf (13.02.2017).